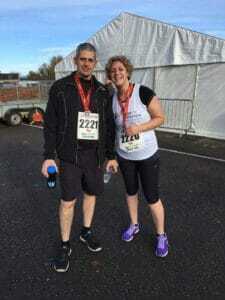 This week it’s Linzi Findlater who took part in The proto-col Chilly 10k with us. ‘Everyone hears of cancer and the horror stories surrounding it. I found a lump in my breast in Sept 2015, thought I best get it checked out. My doctor booked me into the breast clinic. Once all the tests had been done I went for the results, still no care in the world and a positive mind set(with a plan to head out for lunch with my chap and enjoy the rest of my day off). Imagine my surprise when my consultant dropped the bomb shell! I’d gone right off my lunch by this point and my roller coaster of emotions, surgery, chemotherapy and radiotherapy began. Hope for tomorrow gave me the option to choose where I had my chemotherapy treatment, this made me feel a little more in control of a situation where I knew I had to hand myself over to the medical profession. DB Max has given me the opportunity to give something back to a service where words will never be enough! Thank you!